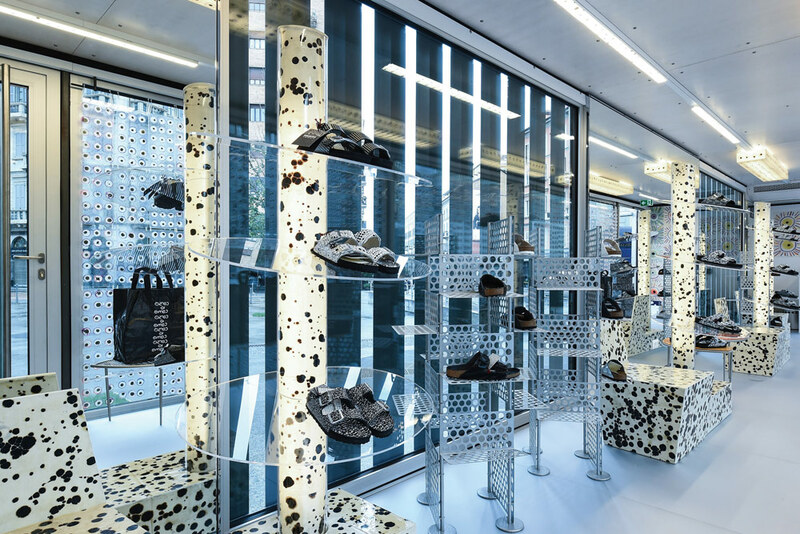 The Birkenstock BOX x 10 Corso Como, a new mobile pop-up concept for select retail partners to customize inside and out. There are days, and then there are days that feel like the End Times. Now, for example. Deadly hurricanes, earthquakes and wildfires are just a few of the natural disasters wreaking havoc on us humans. Toss in nuclear war posturing, terrorism, racial tensions, sniper attacks, cyberattacks, political unrest, economic uncertainty, a pervasive culture of sexual assault and harassment that extends well beyond Hollywood, and you’ve got a witch’s brew. Can a plague of locusts be far behind? It’s hard enough trying to survive in today’s ruthless retail climate without such ominous news. The so-called Retail Apocalypse has claimed numerous victims and others are heading toward the brink. The harsh reality of a new retail world order has forced many to reimagine their businesses. The era of getting away with the same ol’ approach are long gone. So are the days of opening more physical stores to report “growth.” And relying on merchandise or the latest “big” sale to reel in shoppers? That seems like a distant memory. Back in the day, supermodel Naomi Campbell claimed she didn’t get out of bed for less than a $10,000 modeling fee. Well, it’s safe to assume that today’s super-saver consumers aren’t getting off their couches for another “one-day” sale or bogo deal—not when they can probably find the same item quicker, easier and possibly cheaper online, have it delivered the next day for free, and—if they don’t like it—return it for free. The rules of retail have changed. It’s evolve or die. But fortunately, there’s good news on the horizon. Real change is finally happening. DSW, Macy’s, Nordstrom, Target and Neiman Marcus have all overhauled their business models. The new formula is leaner, meaner, more exclusive and—the latest retail buzz word—experiential. From malls to department stores to mom-and-pops to branded flagships, the experience factor is now paramount. In-store custom design studios, intimate private shopping parties, exclusive items and lines, magic mirrors, guest speakers and events, drop-off points for online purchases and returns, community gathering places—they’re all examples of experiential retail. Kudos to all who are putting their best foot forward in this regard. It’s a retail religion sure to convert any cult audience. Skaters and free-thinkers, for example, will likely be drawn to The General by Vans, the recently opened flagship in collaboration with Chris Keeffe, founder of the DQM boutique. This marks the team’s second General store, this one in the holy land of hipsters—Williamsburg, Brooklyn. Events from art shows and zine fairs to designing a custom pair of Vans are featured. “The General is all about experience,” says David Theiss, Vans’ vice president of Direct-to-Consumer. Similarly, shoppers hitting one of DSW’s new concept stores are in for a religious experience. The stores are going back to their “warehouse” roots, adding pallet fixtures and flexible roller conveyors that let them showcase 70 percent more shoes. It allows for curated product stories that mimic an online shopping experience, according to Michele Love, COO. “Today’s customer craves more than just a transaction. They want an experience,” she states. Meanwhile, Birkenstock recently rolled out a new mobile retail concept called the Birkenstock BOX. (Barneys New York was the first U.S. stop.) Retail partners can design and furnish the BOX inside and out, making every stop unique and exclusive. The approach lets retailers offer an element of surprise and moves beyond traditional pop-ups, which often have space and design constraints. David Kahan, CEO of Birkenstock Americas, likes to say the brand is “not in the shoe business; it’s in the show business.” It starts with the shoes, but “people shop to be entertained,” he says. Indeed, the BOX is really cool. It’s worth experiencing. We humans are drawn to art and beauty. And we love cool experiences. It’s what fashion is all about. For our industry, the key is finding ways to make the search for—and discovery of—beautiful, wearable art enjoyable and engaging. That’s an experience that can make any day better.